When rooted in our core self, we feel at home in the world and in ourselves; our lives become effortless and authentic, clear expressions of who and what we truly are, unfolding in the realm of synchronicity rather than causality; we live openly, correctly, and fully, we love well and deeply, and we have a sense of connection, contentment, and joy, of sacred meaning and value. 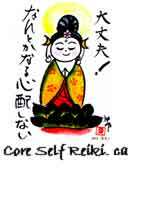 The purpose of Core Self Reiki.ca is to encourage individuals to discover, reclaim, deepen, and integrate their experience of their core self through the practice of Reiki Ryoho. please contact Elyssa Matthews .